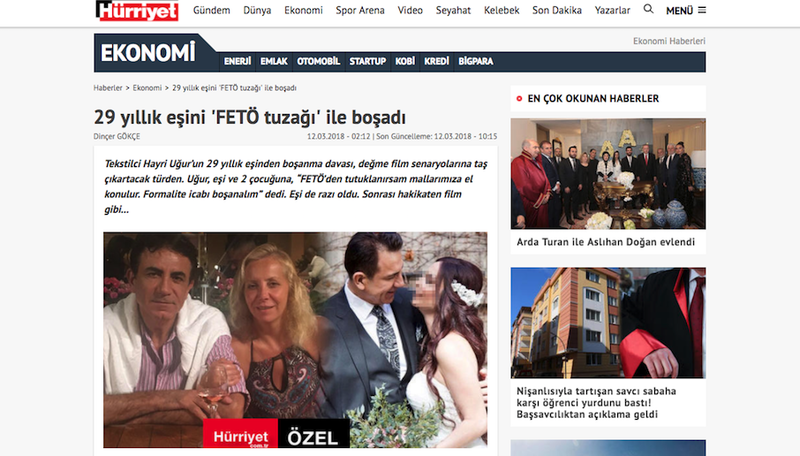 Turkish businessman Hayri Uğur has convinced his wife, Hepşen Uğur to divorce him on the grounds that their properties would be seized in case he gets arrested over ties to the Gulen movement, according to Hurriyet newspaper. Uğur, a 57-year-old businessman who also chairs the Mersin-based Mediterranean Textile and Raw Materials Exporters’ Association, started warning his wife that all his friends are being prosecuted over Gulen ties and that his alleged links are likely to be questioned as well, Hurriyet revealed in a report on Monday. The businessman allegedly convinced his wife to divorce for the sake of formality as part of a measure against a would-be seizure of their properties worth around TL 200 million [$55 million]. However, Uğur disappeared after the divorce only to get married to his lover with whom he has been in a secret affair for 5 years. In mid-February, Hepşen Uğur filed a complaint with a court stating that her former husband defrauded her and swindled possessions from her. Meanwhile, the businessman married to his lover about 10 days ago, Hurriyet said. The government blames the Gulen movement for the July 15, 2016 coup attempt while the group denies role. More than 1,000 companies with a total value of $12 billion in assets have been seized and then transferred to Turkey’s Saving and Deposit Fund (TMSF) since the coup attempt on July 15, 2016.